Soulpepper’s project of reviving “classics” of Canadian drama has been quite instructive. Some works like David French’s Leaving Home (1972) and John Gray’s Billy Bishop Goes to War (1978) have held up well, while others like John Murrell’s Farther West (1982) or Judith Thompson’s White Biting Dog (1984) have not. One might have thought that Hosanna from 1973, one Michel Tremblay’s most famous and widely performed plays, would be an unassailable classic. But Soulpepper’s current production, unintentionally, demonstrates that the play has dated badly. It is not merely that the play is set in a social context that is rapidly fading from view, but, worse, the point of view of the characters and of the play itself on such essential issues are gender and identity now seem particularly unenlightened. In seeing the play in 2016 what jars most is how its imagery and themes hinge on binary oppositions – male versus female, gay versus straight – that today both inside and outside the gay world are regarded as reductive. Claude Lemieux known by his drag name Hosanna (Damien Atkins) has lived with Raymond Bolduc, a biker/leatherman, known by his nickname Cuirette (Jason Cadieux). While it is advanced for 1973 that the two say they are married decades before such a relationship could be legally sanctioned, one man has taken on an extreme feminine persona and the other an extreme masculine persona. Cuirette says that in their sexual relationship he is always the “man” and Hosanna is always the “woman”. What that means colloquially is that Cuirette is always the top and Hosanna always the bottom. The problem is that today we regard it as foolish and very outmoded to regard sexual roles in such a way. Calling a bottom the “woman” derives from a misogynist view that that woman are passive and weak and exist at a level below that of the “man”. Similarly, when Hosanna asserts that he is really the “man” in the relationship because he earns the money and Cuirette is the “woman” because he does the cooking and cleaning, Tremblay has his characters express extremely old-fashioned views of what male and female roles are supposed to be. Tremblay wants to create a paradox between the personae the two men adopt, its sexual expression and the reality of their socio-economic relationship, but his views are based on suspect, androcentric premises. were deemed to be its leaders. But his rise to the top and his pitiless criticism of everyone around him has only engendered hatred and led to an event where his pride was universally mocked. The problem with this central theme of the play is connected with the other false oppositions Tremblay promotes. Why does Cuirette or Tremblay force Hosanna to choose if he is a man or a woman? Today we would simply say that Hosanna is a man who identifies as a woman. This most accurately describes Hosanna’s behaviour in the play. Yet, the notion of being transgender is not one Tremblay has imagined as a possibility. If he had thought of it, he could never portray Hosanna’s declaration that he is a man as a revelation. But then, if Tremblay had thought of it, the dynamic of “Am I a man or woman?” that drives the action and the dialogue would not exist. With transgender rights having become so prominent, Hosanna’s revelation that he is a man, now does not look like insight into his identity but a denial of it. While the way Tremblay has framed the entire argument of the Hosanna now appears faulty, there still is much that has not dated. Prime among these is Tremblay’s portrait of that feature of Canadian literature that Northrop Frye called the “garrison mentality”. In Frye’s view Canadian literature is about the restrictions of growing up in a confined community and how these restrictions eventually lead to the community turning in upon itself. The drag community to which Hosanna belongs is a minority community within the gay community which is itself a minority community in Montreal. The play depicts perfectly how a community without power strengthens itself by turning on one of its own, with Hosanna as its victim, chosen because of his success. Politically, the gay community in Montreal oppressed by the police is meant to be seen as parallel to Quebec in general swamped by anglophone Canada, and Canada in general overwhelmed by the United States. The fact that Hosanna would choose Elizabeth Taylor as his idol shows the dominance of American popular culture over both Canadian and Québécois culture. What also survives is the accuracy of Tremblay’s portrayal of the tensions that can exist in a gay relationship where a line has to be negotiated about how open the relationship is while still being a relationship. 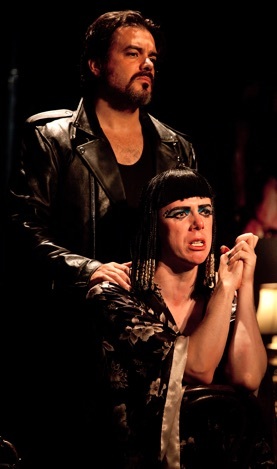 The most effective aspect of the play is Tremblay’s exposure of ageism and lookism in the gay world, where an increase in age or a perceived decline in attractiveness leads to a decrease in value as a person. Both Cuirette, who is putting on weight, and Hosanna, who is acquiring wrinkles, fear a future of being deemed undesirable. This is, of course, another way in which an oppressed community can itself oppress its own members. stage as if Hosanna could not escape our gaze? The meaning is unclear and since the mirror does not appear as an organic part of the set it works mostly as a distraction. Direction cannot resolve the difficulty of the play’s anti-transgender stance, but Prest’s direction does not help the ending even as written. After Hosanna declares he is a man, Prest has Cuirette pick Hosanna up and carry him as one would a woman or a bride toward the bed. Is Prest thus negating Hosanna’s major revelation by having Cuirette say through his gestures, “But you’re still my woman”? This only makes the ending more problematic. For those not worried about the play’s implications, what will carry them through are the performances of Atkins and Cadieux. 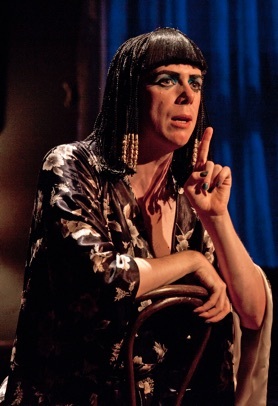 Atkins makes the part completely his own and in so doing creates a version of Hosanna quite different from those of the previous three productions I’ve seen. Atkins’ Hosanna may weep but he doesn’t portray his fateful humiliation as a tragedy. Rather Atkins’ Hosanna is overwhelmed with the irony of his life and copes with it sometimes by lashing out in anger at Cuirette, sometimes by self-flagellation. What Atkins shows us is a mercurial mixture of wit and bitterness that gradually works itself out towards acceptance. Atkins’ genius is in demonstrating how easily wit can injure as well as uplift. Cadieux makes a very sympathetic Cuirette. It becomes clear early on that although Hosanna may provide the couple with financial stability, it is Cuirette who gives it emotional stability. Cadieux’s Cuirette suffers through Hosanna’s tirades less with a sense of anger than of pity. Cadieux leaves no doubt that Cuirette, despite understandable bursts of anger, does everything out of love for the needy, volatile creature that Hosanna is. Tremblay has drawn the relationship of the couple so well that it is too bad he has tied it to the false dichotomy of male versus female. The play could work if Hosanna were to view his life from both sides of the dichotomy only to realize that there need be none. His concluding revelation could be, “Man, woman – I m me! Get used to it”. Unfortunately, the dichotomy is so deeply embedded in the language and structure of the play, that only heavy revision could save it, and why should Tremblay alter it if is already acclaimed as a “classic” of Canadian literature? Hosanna is thus likely fated to be studied as a relic of gay literature in Canada rather than to continue life on the stage. Efforts to accept transgender people are so strong at present that the play now looks like the embodiment of exactly how not to portray the topic. The play is 43 years old now and, unlike with true classics, age has not been kind. Photo: (from top) Jason Cadieux and Damien Atkins; Damien Atkins; Jason Cadieux and Damien Atkins. ©2016 Bronwen Sharp.